It has become apparent after 15-months of analysis and reporting that each month of mining workforce planning data has a theme. This month the theme is ‘A Return to Growth’ as the sector returned to pre-commodity bust norms in relation to employment. Like the most recent ABS data which showed an increase in Australian employment by 71,400 (the largest increase since July 2000) the Mining Workforce Planning Scan for March received its first positive reading after nine consecutive months in neutral or negative territory. All of this comes at a time when most of the big-ticket minerals return to sustainable levels of pricing. Noting that the high-commodity price period ended in late May 2012, iron ore has since returned to sustainable levels (>$110 per metric tonne) from October of last year while thermal coal has nudged past the $100 average in the past month. Less bullish is bullion as it continues its malaise with gold and silver trending down after highs experienced six-months ago. To emphasise the return to growth the first graph is a positive/negative index looking only at the Employment data. I’ve included a three-point polynomial trend-line which tracks the high price commodity period (pre June 2012), commodity crash period (May 2012 – Feb 2013) and eventual return to growth this month. More good news than bad from Employment gave it the highest content count for the second consecutive month while at least three Australian mining work-related deaths put Work Health and Safety (25%) a close second. In another positive sign for mining employment Diversity (9.7%) had several good stories this month which propelled it to third place. Generally, softer workforce planning indicators strengthen as the employment situation improves. At +5, Learning & Development was the most positive indicator for March with all five stories this month reflecting Australian research and being of a positive nature. Both Diversity and Employment closely followed with +4. Reporting of ten Australian significant safety incidents, which included three fatalities and three major injuries against only one positive story propelled Work, Health & Safety to a -9 rating for March. Interestingly Alcohol & Other Drugs/Crime, at -4 was the second most negative indicator as miners featured in four stories including housing explosives at home, increasing use of drugs during downtime and a NSW miner who murdered his girlfriend. Here is a look at the indicator data for March. Probably worth noting that the Workforce Planning content has increased percentile wise month-on-month since January (25.1%, 34.4% and now 38.5%) but still remains on the low side compared to 2012 (averaging 44.8%). 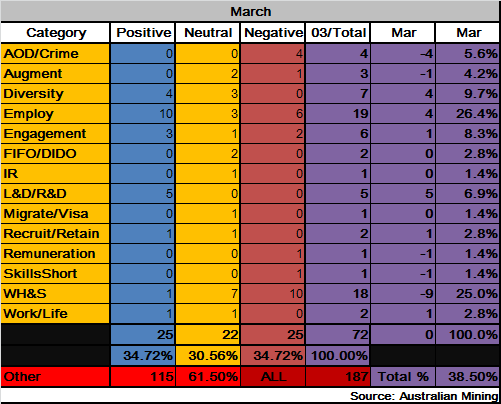 Additionally any thought that the FIFO enquiry findings which saw the FIFO/DIDO indicator crash to a record -4 negative sentiment last month continuing into March were dashed as the topic was hardly raised during the month. Goes to show you how much notice everyone (outside of Canberra) takes of Senate and Standing Committee reports. March saw another set of good employment numbers reported with 2044-jobs added this year and the Shenhua Watermark Coal Project looking likely to construct another Western NSW mine in 2014. There is still cost cutting going on especially as coal continues to trim fat, reflected by the -317 jobs reported lost in March. Notably Xstrata announced the closure of its Brisbane coal office (although the location is still visible on its web-site as at 29 March). This has to be seen as both a display of its lack of long-term confidence in its coal assets and potentially the pro-mining Queensland government which has been struggling with higher than average unemployment levels since it came to office in March 2012. 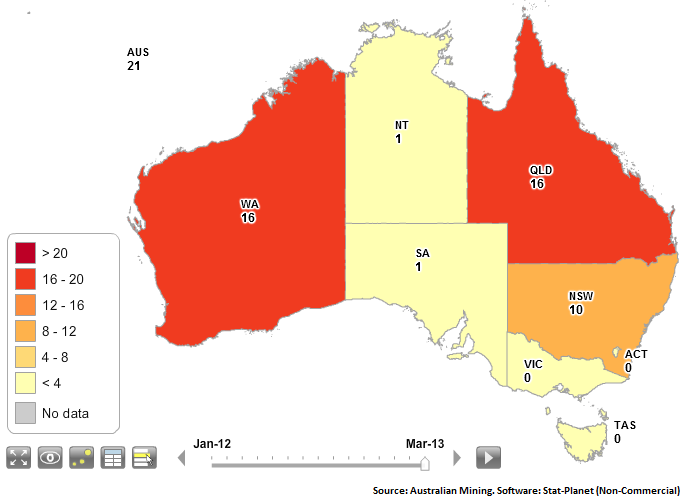 The mining centric states of Queensland and Western Australia again dominated with 16-stories (22.2%) each. New South Wales had 10-stories (13.9%), then the Northern Territory and South Australia had one apiece 1.4%. On a national level there were 21 Australian stories (29.2%), two for China (coal-disasters), and one each for Indonesia, Namibia and New Zealand. On a humorous note the story of the month was a Recruit/Retain tale from Indonesia when coal miner Pt. Karya Bumi Baratama advertised for a receptionist asking specifically for “good looking” single females under 25 to apply. Having married into an family with an Indonesia background I have some empathy and can envisage the writing style in Indonesia. If we are honest with ourselves I can’t see much difference when companies request ‘well-presented’. Lucu banyaklah (Very funny indeed)! To sum up, all the indicators now show that the mining sector has returned to its pre-June 2012 growth phase. Employment numbers look good this year and outside of a disaster in China or a collapsed US economy I can only surmise that these numbers will remain static for the rest of the year. On that, it would be worthwhile keeping an eye on indicators like Industrial Relations, Migrate/Visa and Remuneration in coming months. A pick up in content and how it plays in terms of positive or negative sentiment will potentially highlight another sector increased wages demand cycle, a situation that the industry is continuing to downplay, even as some commodities return to reasonable margins. I agree that Industrial Relations is the one to watch in the coming year. I reckon that we are about to witness a (short lived) quantum leap in militancy initially, thence a severe crackdown which will gut the powers of the Unions, and possibly deliver a period of calm in which to address the (lack of) productivity issues.